There are many apps available in play store which can be used to record screen video in android phones. But all of them either are paid apps or need a rooted phone. Most people who start out searching for a free and easy way finally end up in a dead end. Your screen will get recorded as a video file "myscreen.mp4" in your SD card. Android Screen Video Recording Made Easy. A small standalone adb package from google (the sdk part). A batch file you can double click to record your android screen. To start recording, first connect your android phone to your PC via USB cable and enable debugging mode. To do this, go to "Settings"->"Developer options" and select the "USB Debugging" option. 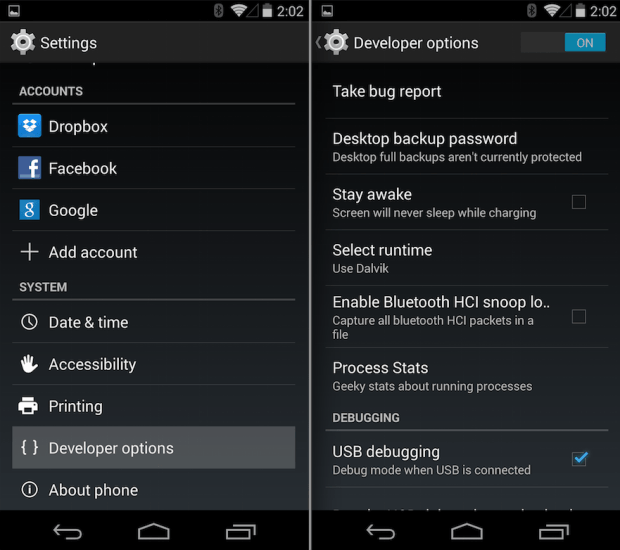 In case you can't find "Developer Options" in Settings, here's how to enable it - Enable Devloper Options in Android. Now double click on the "AndroidRecordScreen.bat" file. It will fist inform you that the recording process will open up a popup window and you need to close the popup window to stop recording. Just press any key to start the recording. A popup might appear the first time on your phone asking for granting permission to record. If you don't approve, the recording will not proceed. As mentioned earlier, close the popup window to finish recording. Once done, the recorded file (mp4 format) will be copied to the same directory on your PC with a name something like rec<number>.mp4. The recorded video will not be deleted from your phone. If you don't want the video in your phone, make sure to delete it later on to save space. Hmmmm... the adb is quite recent actually. May I know which version of android are you using? Seems not working for me. 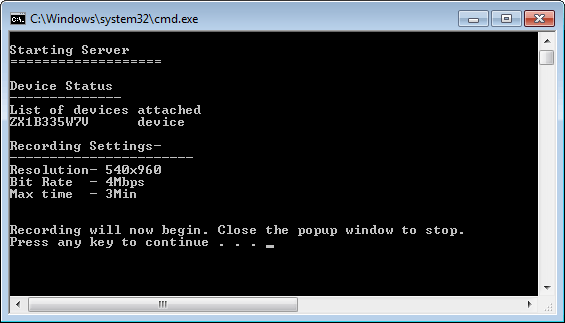 1-The informations in the Cmd says thats work. 3-Also it's save on my devices, not my Sd Card . 4-In the video , Cmd pop up 2 Window , but i got only one during recording. "Hard" way? You should have tried doing things in the 1980s if you think this is "hard". You'd never have got ANYWHERE. Recording will now begin. Close the popup window to stop. Works great. I just wonder if there is a way to get past the 3min. rec limit? But still without audio... =/ I'm looking for a solution to record the internal (system) audio for my gameplay videos. also curious has anyone found a way to go longer than 3 mins? Hii Arun. I just wanted to ask if it records Internal Microphone sounds & also the inbuilt sounds of the game running..? Record your android screen video without using paid apps or rooting your phone.